Thank you so much for visiting the Coventry Creations Wholesale site. We are so Happy that you are here! We have many new and exciting news here that we would love to share before you go onto browse our site. 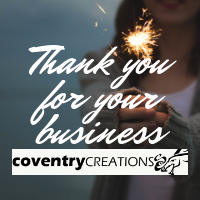 If you are new to Coventry Creations, please take a minute to create an account, once approved, you will have full access to the site including prices and ordering abilities. If you would like to see our many product offerings, you can enter our store here. Don’t push Halloween out the door on us, the celebrating has just begun. Be the cool store for your last minute or just in time shoppers by making sure our limited edition Halloween candles are still on the shelf. Available throughout October are our limited edition world magic Halloween candles. 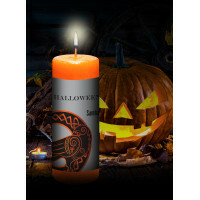 The Samhain candle is a gorgeous pumpkin color and its fragrance is out of this world. 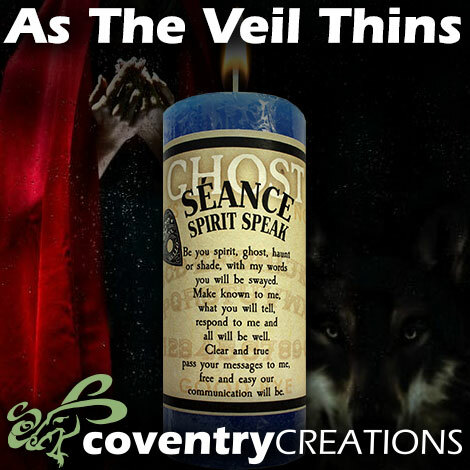 We’ve also brought back our beloved Hekate, Queen of Ghosts candle for the season. She’s boldly black and sweet as a summer afternoon in the garden. Both will be available through October 31st. Both are 2”x 6 ½” and $9.75 each. Ghost candles for all your other worldly needs are also be available through October 31st. Stock up on Séance, Night Terror, Home Clear and Bless and Ghost Repel. 2”x 4 ½” and $5.50 each. 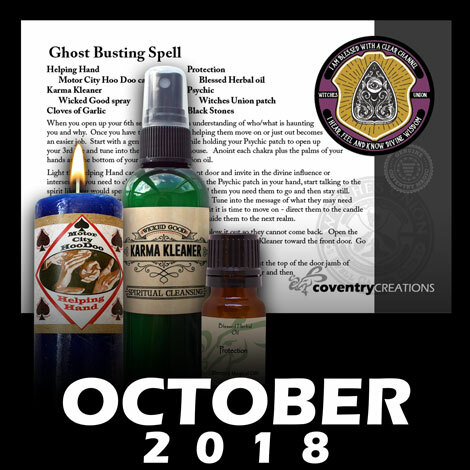 The opportunity to talk to the ancestors continues into November and your customers are going to need Coventry’s Ghost and World magic candles to help create the sacred space. While supplies last, we will ship Dorothy Morrison’s Wicked Witch Halloween candles. 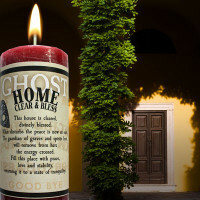 These funny and potent candles are just what your customers are looking for to help them with their haunting problems. All new recipes and spells with a new label design. As the Cauldron Bubbles will put gossipers in their place. The Conjurer candle empowers our magic. Spirited Discourse helps us speak with spirit guides and loved ones. Haint Happenin’ busts ghosts for good. Same size and price ($5.50) as her other Mojo candles. These limited edition candles will be available for the whole month of September and October while supplies last. No discounts on the limited Edition Wicked Witch Halloween candles, World Magic Halloween and Hekate and Ghost Candles. Call us and place another order. Do you offer psychic development classes at your store? Our Psychic patch is a fun way to honor your students for a job well done. Do the meditation as a group and share experiences. We all learn from each other! Bonus, we have started a Witches Union Spell Caster Group on Facebook. Announce your class, share pictures and stories. Thank you for participating in our Be the Change contest! As you know this cause is near and dear to our heart. It’s in our nature to be a positive force in the world, by acknowledging all the generous and compassionate people out there. Your enthusiastic participation has meant the world to us and we hope to do this again and raise money for another cause. The winner will be chosen on October 15th. Good Luck. By now you are getting quite a few customers asking for house clearing services or advice on how to deal with ghosts and hauntings. If you don’t have the staff or time to perform it yourself, direct them to this Witches Union Spell caster club Ghost Busting Spell card. Make sure you have all the supplies they need on hand. This month the veil between the worlds begins to thin and is so thin by the end of October, just about everyone will have a spectral experience. Prepare yourself and them by stocking up the supplies needed to perform this well written Ghost busting spell by Jacki Smith. When you open up your 6th sense, you gain an understanding of who/what is haunting you and why. Once you have that information, helping them move on or just out become an easier job. Start with a gentle meditation while holding your Witches Union Psychic patch to open up your 3rd eye and tune into the energies in the house. Anoint each chakra plus the palms of your hands and bottoms of your feet with Blessed Herbal Protection oil. Light the Helping Hand Hoo Doo candle close to your front door and invite in the divine influence or intersession you need to clear your home. Keeping the psychic patch in your hand, start talking to the spirit like you would speak to a long lost friend. Tell them you need them to go and then stay still. Open your psychic centers and receive your answer. Tune into the message of what they may need from you and is in your power to grant. Tell the spirit it is time to move on – direct them to the candle and use its flame to find the divine beings who will guide them to the next realm. When you feel they are moving through the candle, blow it out so they cannot come back. Open the front door and start from the back of your home, spray the Karma Kleaner toward the front door. Go room to room to push all energies out the front door. Place a clove of garlic and a black stone anointed with Blessed Herbal Protection oil at the top of the door jamb of every exterior door in your home. Spray yourself with Karma Kleaner and then dispose of the Helping Hand Hoo Doo candle. Do you like the spell you read here? Don’t forget to sign up for our newsletter, for more Coventry magic delivered right to your inbox. Visit our website to browse the Blessed Herbal candles and more and make sure to check out our new Witches Union swag. 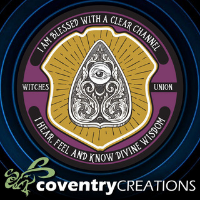 This line of fun products celebrates the powerful witch in you and your part in our community. We have a new Witches Union, Spell Casters Club Facebook group, ask to join. As always, we love to hear that beautiful voice of yours! If you have any questions for us, call 800-810-3837 or email us at sales@coventrycreations.com and we will be happy to help in any way that we can!